aka: Joe...Cercati Un Posto Per Morire! 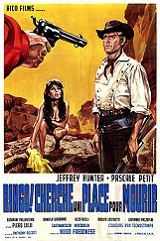 Jeffrey Hunter stars as an outcast Confederate soldier, who redeems himself by defending a woman (Pascale Petit) against bandits willing to kill for her goldmine claim. This was to be one of Jeffrey Hunter's last films. While in Spain to film the Chicago Mafia story Viva Am�rica! (1969), Hunter was injured in an on-set explosion, suffering facial lacerations from broken glass and powder burns. Later an old friend, a former British commando, accidentally hit him on the chin with a karate chop when Hunter, who knew judo, failed to defend himself in time, banging the back of his head against a door. Then, while on the plane with his wife returning to the United States, Hunter's right arm suddenly became semi-paralyzed and he lost the power of speech--two signs of a stroke. He was taken directly off the plane upon landing, to a hospital in Los Angeles. He soon recovered and was released after a couple of weeks. Shortly after signing to co-star with Vince Edwards in The Desperados (1969), Hunter suffered another cerebral hemorrhage while on a short flight of steps in his living room and collapsed, injuring his head in the fall. It was not known how long he had been unconscious when he was finally found. He died without regaining consciousness the following day, on May 27th, 1969, after surgery to repair the skull fracture. He was 42.